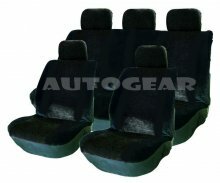 Black Suede Car Seat Covers Set. Quality Black Suede Velour look car seat cover set. Enhance the interior of your vehicle. Ideal to cover and protect against wear and tear, spills, pets etc. Easy to fit and remove seat covers. Complete set of universal covers to fit most models. Contains 11 pieces, 2 Front covers, Rear covers & 5 Headrests .